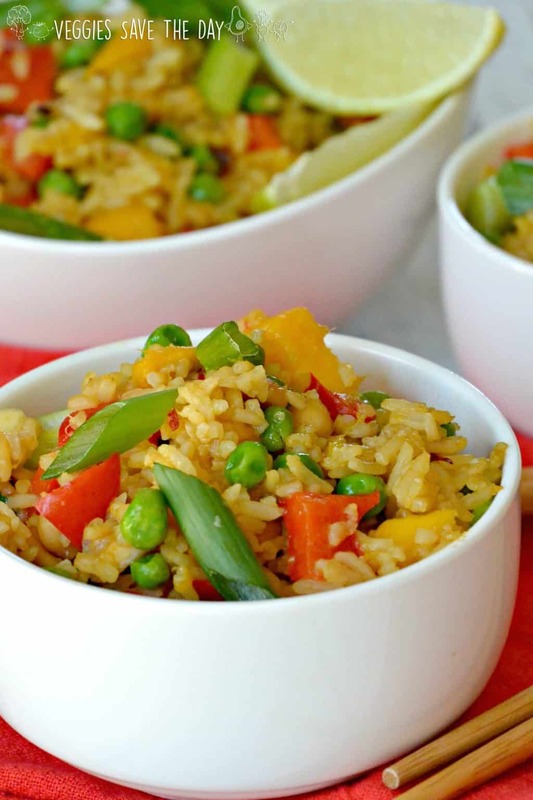 Spicy Mango Fried Rice is easy to make with leftover rice and a few simple ingredients. It’s vegan, gluten-free, and oil-free. I love having an arsenal of easy flavorful recipes I can make any night of the week. It’s especially nice when I can use up leftovers I already have in the refrigerator. That’s why I love making Spicy Mango Fried Rice. I always save the leftover rice when I make other dishes such as stir fry. And some weeks I will make a big batch of rice in my Instant Pot to use throughout the week. You can either refrigerate it or freeze it until you need it. And when you add spices like Organic Crushed Red Chili Flakes from Frontier Co-op, your dishes will never lack flavor. 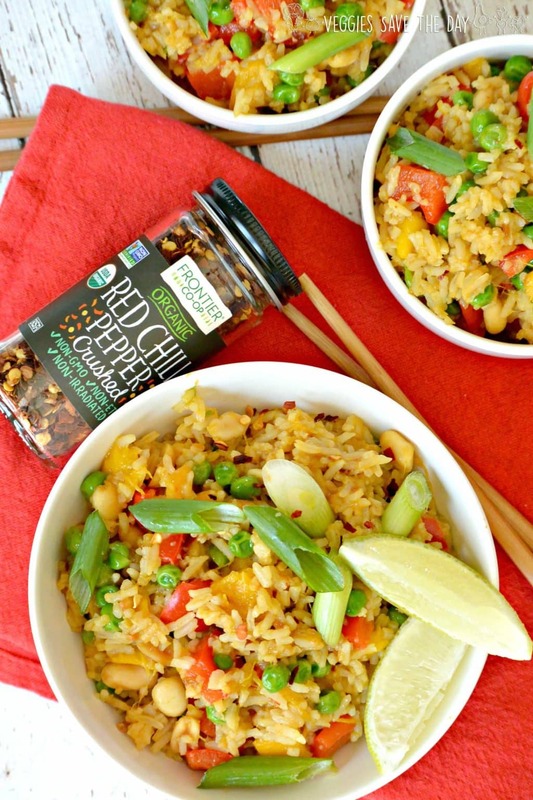 One thing I love about using Crushed Red Chili Pepper in recipes such as Spicy Mango Fried Rice is you can add some spices at the beginning, then more when you serve the dish. Because some people like it hot, and some people not so much! I find when I use the Frontier Co-Op Organic Crushed Red Chili Flakes at the beginning of cooking verses adding some at the end, their flavor is slightly different. I suggest experimenting to discover which way you like it best. You really can’t go wrong either way! I also like to use the red chili flakes in Italian dishes such as Eggplant Bolognese Pasta, Tomato Mushroom Pasta, or pizza. They also go well with breakfast dishes such as tofu scramble. 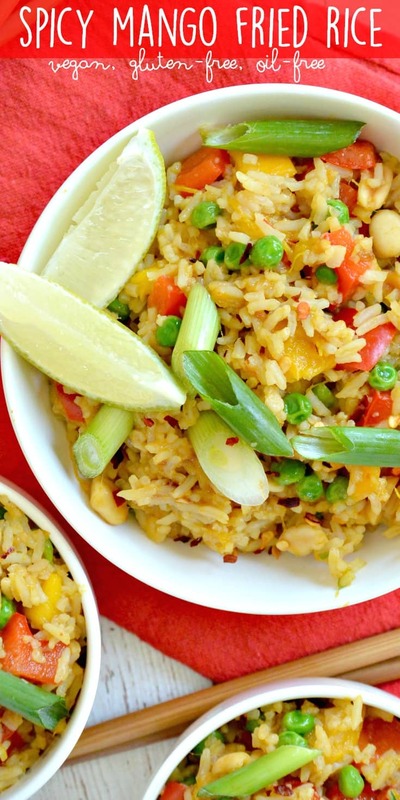 And of course they add a lot of flavor to Asian dishes such as stir fry and this Spicy Mango Fried Rice. Add as little or as much Crushed Red Pepper Flakes as you like. I start with 1/2 teaspoon when I make Spicy Mango Fried Rice, then add more later if I want extra heat. My rule of thumb is you can always add more, but you can’t take it out! Feel free to customize this recipe to suit your tastes and whatever ingredients you have on hand. Don’t like mango? Try pineapple instead. Can’t stand peas? Leave them out and use green beans or carrots. No matter what you choose, #SpiceUpSummer produce with savory spices and Use Frontier Co-op to #CookWithPurpose. 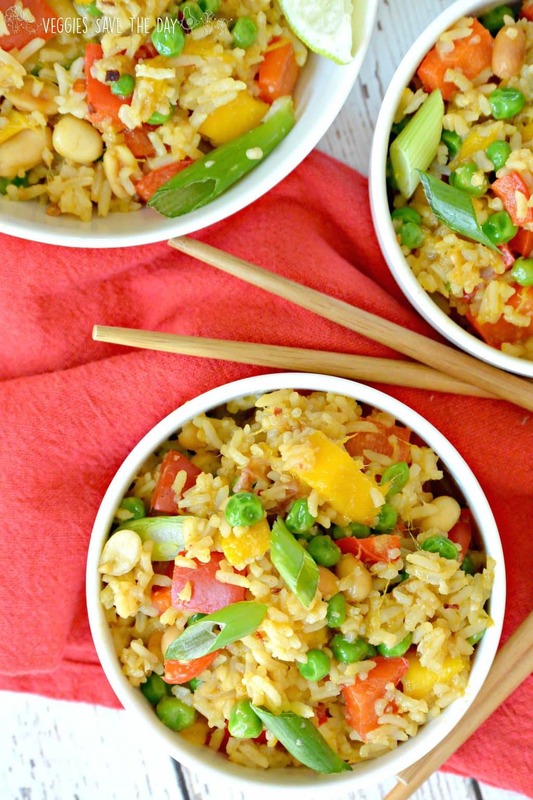 Now let’s make Spicy Mango Fried Rice! Make this oil-free recipe as mild or spicy as you like. I like to serve it as a main dish since it's a complete meal, but you can also use it as a side dish and serve 4 people. Heat a large non-stick skillet or wok over medium heat. Saute the garlic, ginger, and crushed red chili pepper flakes for about 30 seconds until fragrant. Add the red bell pepper and saute a few minutes until soft. Add a little water if the pan appears dry. Add the cold rice and tamari. Mix well and saute until the rice is heated through. Add the peas, mango, and peanuts and saute until the peas are heated through. Transfer to a serving dish and garnish with the green onion and lime wedges, if using. 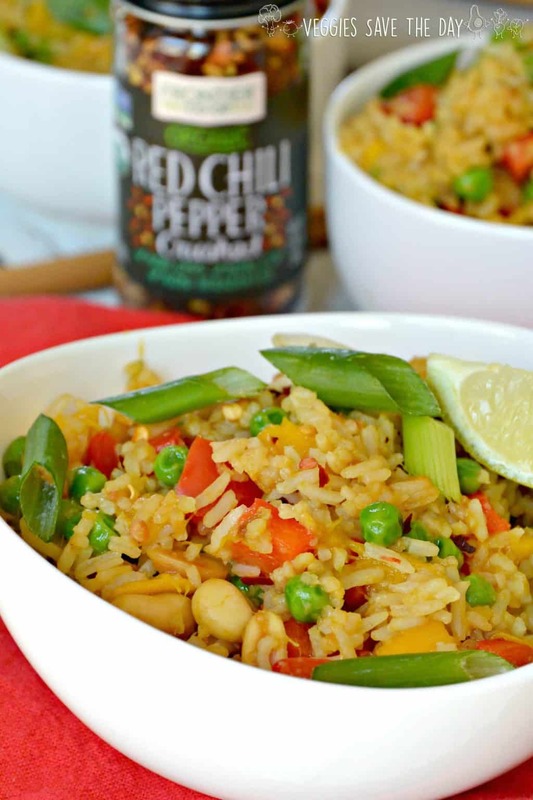 Serve with extra crushed red chili pepper flakes for those who want some extra spice. I like to use a microplane fine grater for mincing the garlic and ginger. Oh yum! I’ve had pineapple fried rice, but never mango. This looks like a must-make. Thanks Becky! I think you’ll enjoy it! OMG! 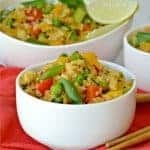 I love pineapple fried rice but never thought of mango, this is genius! Thanks Jasmine! I love mango! I’m definitely a crushed red pepper kinda gal!! One of my fav seasonings, and I love the organic Frontier Co-Op brand! Bet it is perfect with the sweet mango. Thanks Sarah! I really like it, too! Ooh, I love mango fried rice! I bet Irving would like this spicy kick!!! Looks amazing! Thanks Mary Ellen! It’s so easy to make, too! Oh my goodness the flavours in this sound incredible, I NEED to try this! Oooh! YUM! I love fried rice and am so intrigued by the mango. I absolutely love spicy too so I’m all in! Thanks Sophia! I think you’re going to like it! I love it with pineapple, too, but mango is our #1! Wow! This sounds so good. I love that this is oil free! Thanks Sarah! I like it better than traditionally greasy fried rice. Sounds super flavorful and delicious. I love the labels on Frontier spices – they really grab my eye! Thanks Jenn! Yes, I love their packaging, too! That’s wonderful, Dawn! I hope you enjoy it! I never thought to add Mango to my fried rice, I might be able to take the spice with the help of the mango! You don’t have to make it spicy if you don’t want to. It’s great mild, too!